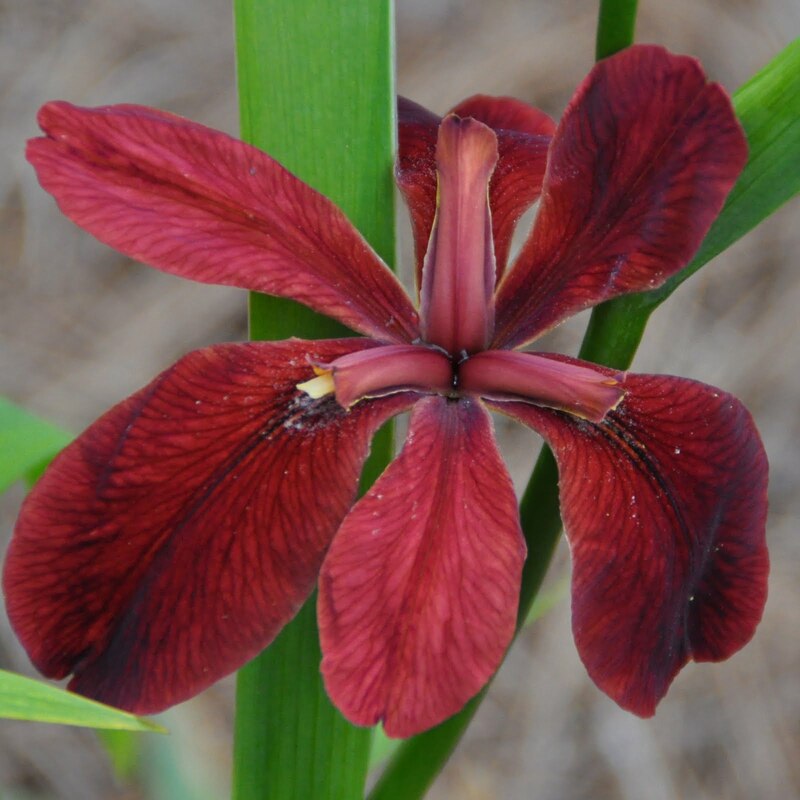 In previous blogs, we’ve examined traits of 4 of the 5 Louisiana iris species. Now we will look at how these attributes come into play in the modern cultivars. 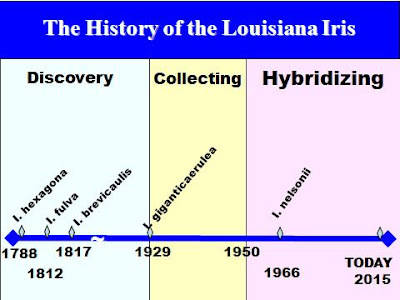 As you can see in the timeline below, collecting didn’t garner attention until around 1929 with Dr. John Small's discovery and promotion of Louisiana iris. It wasn’t until the 1950’s that growers began dabbling in hybridizing in earnest. Until that time, most Louisiana hybrids were either collected or grown from collected seedpods. 'Black Widow', a 1953 introduction grown from collected seeds, won the Mary Swords DeBaillon Award in 1968. Although the parents are not known, from growing this cultivar for many years, I believe it to be mostly I. fulva with some I. giganticaerulea. When used in hybridizing, the seedlings come out looking like I. fulva. 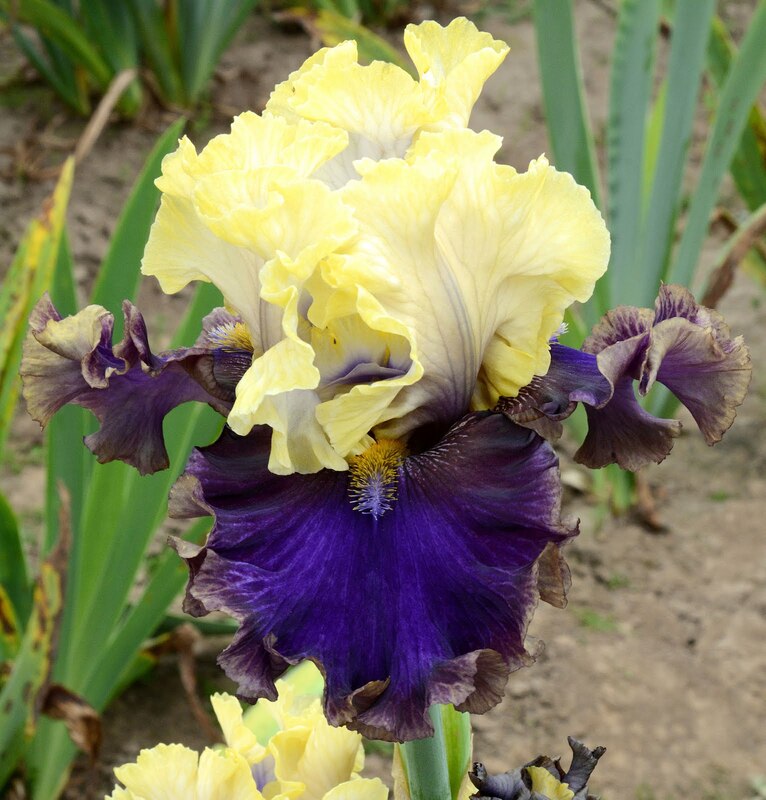 One of the first objectives of the early hybridizers was to extend the growing range of hybrids further north. Most of the natural hybrids at that time were collected I. giganticaerulea crosses, and did not fare well the further north you went. Mr. Frank Chowning of Arkansas was one of the first hybridizers to work on cold hardiness. Most of his hybrids involved crosses with I. brevicaulis. 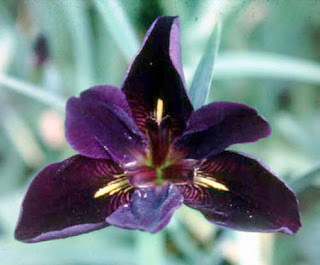 The characteristics of I. brevicaulis can be found in many of his hybrids, (shorter stalks, later bloom, blue coloring). A short time later I. fulva was included in the breeding program, adding the colors red and yellow to the palette, as well as height to the plants. 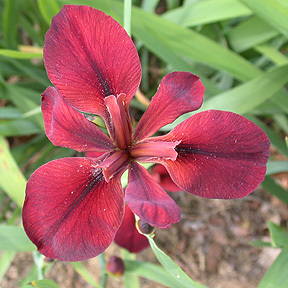 And finally, with the inclusion of I. nelsonii, taller stalks, deeper reds, and the over-lapping form appeared. Below we have 'Ann Chowning', considered to be one of the first real red Louisianas. One of my own introductions, 'Pointe Aux Chenes', demonstrates the range of traits discussed here. It is a mixture of the four species mentioned. 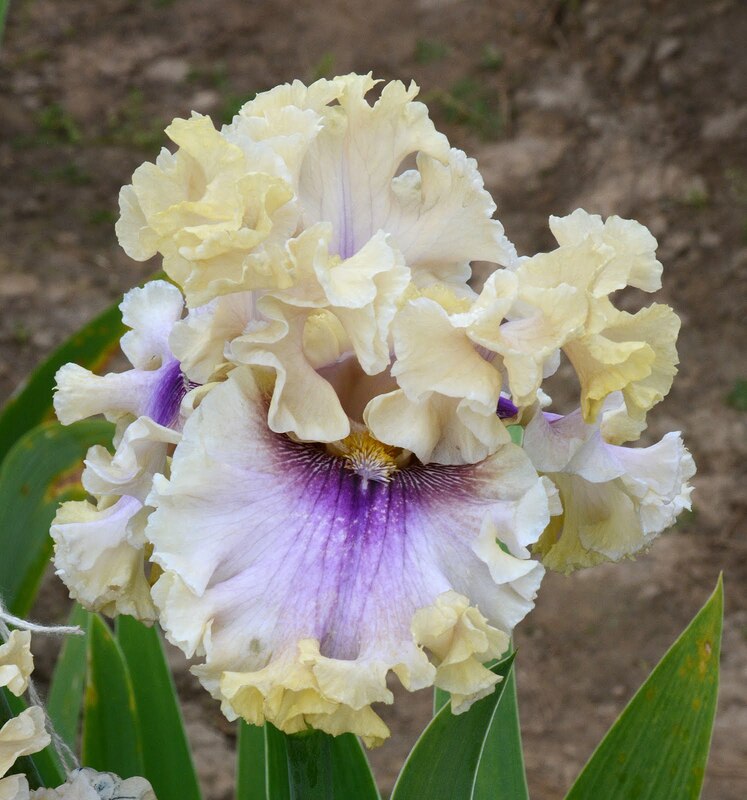 It grows well everywhere I have sent it, and has many qualities we look for in modern Louisiana cultivars: a stronger stalk, a fuller form, and cold hardiness, to name a few. In future blogs, I’ll be discussing more LA iris traits and how to recognize them in modern hybrids, with the goal of better understanding the Louisiana iris. When I attended the 2015 AIS National Convention in Portland, Oregon, I made sure to take the optional garden tour, which included the Keith Keppel Garden. I had visited Keith’s garden twice when it was Stockton, California. The last time was in 1986 when the AIS National Convention was in San Jose’, California. 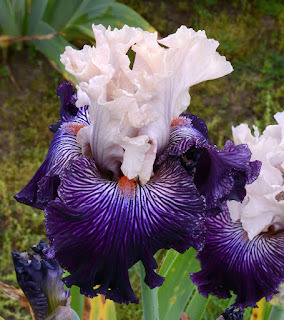 A few years before that, I visited his garden when on a business trip to the Electric Power Research Institute in Palo Alto … when it just happen to be the iris season. So it was with some excitement that I first glimpsed Keith’s current garden from the bus window. It was past peak bloom for his tall bearded irises, but there were still many wonderful flowers to see. The day was cloudy but bright, an ideal light for photography. With only one and a half hours before the bus captains would blow their whistles, there was not enough time to properly evaluate seedlings. However, I did see a lot of very interesting flowers. The tall bearded irises pictured below may or may not be introduced since it takes much more that a pretty flower to make a worthy introduction. Nevertheless, it is does show the hybridizing direction in which Keith is going with his tall bearded irises. So let’s take a look. This flower is a golden honey color with an ideal form. The tangerine beards provide perfect contrast as does the dark coloring at the base of the standards. 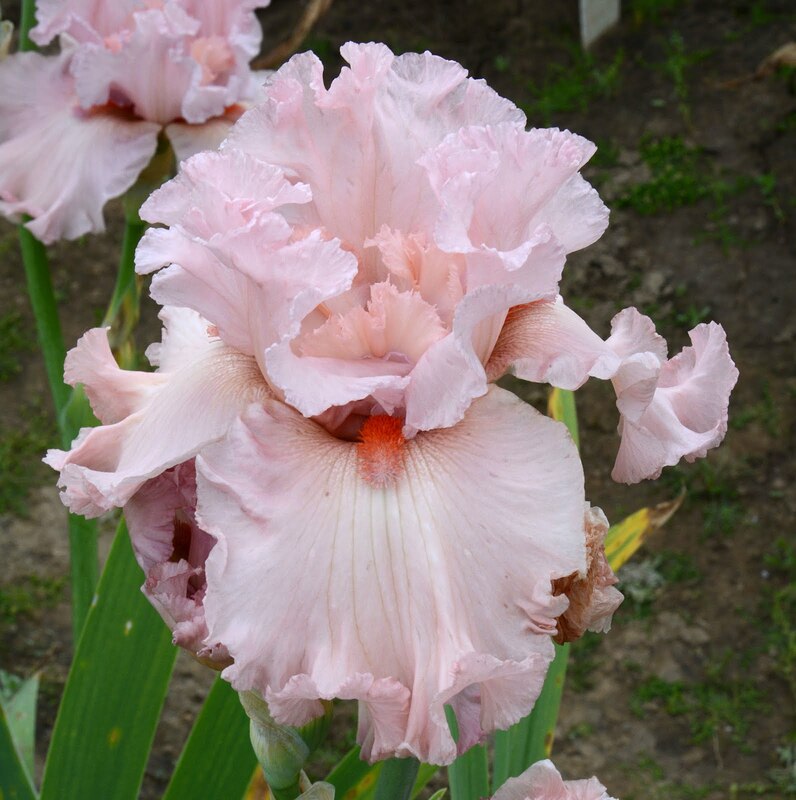 The iris world always has room for another pink. And this is a beautiful baby-ribbon blue pink, with nice form and ruffles. This is a flower of nice form and proportion. Gray standards sit atop medium dark blue falls. The dusky beards echo the mood of the standards. This is flower of earthen tones. The standards are a very special attraction with their dark mahogany color. 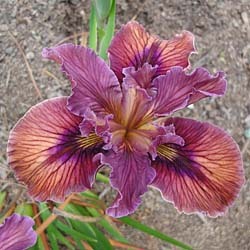 The lavender blaze under the gold beards adds interest. This is a blue amoena, in which it looks like the blue was brushed onto the falls leaving some of the white showing. The added attraction is the dual colored beards, the inner being a dark red orange and the outer being light blue. The full flair provides a dynamic feel. It reminds me of butterflies fluttering around the clump. Now this one is really different. I think of it as an ink-blue reverse amoena trimmed in gold. This is one voluptuous flower. 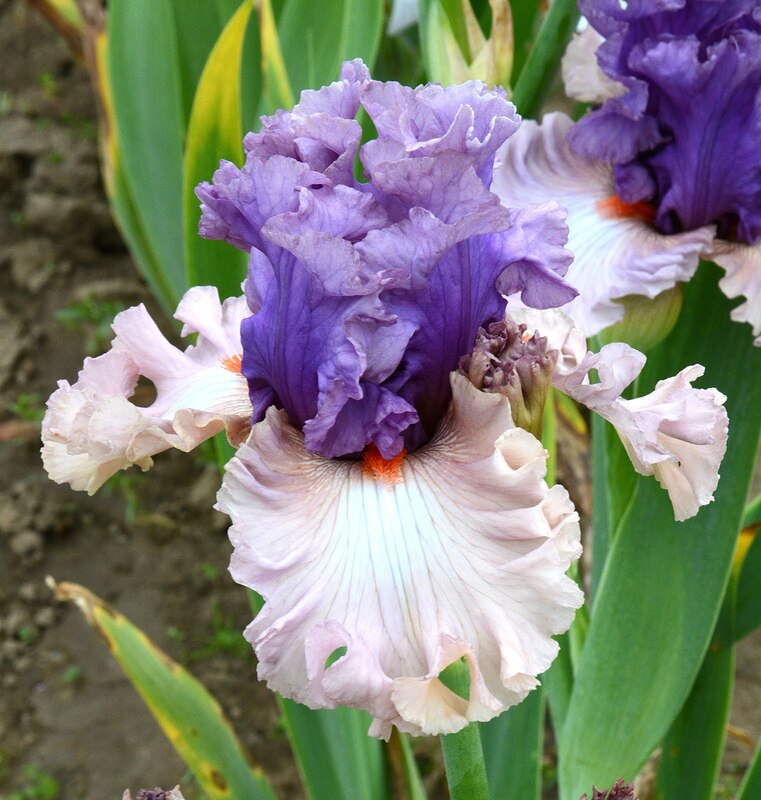 The apricot standards are not timid, but are in good proportion with the lavender blue falls with the gray edges. The generous beards finish the look. I have seen this color combination before. But never have I seen it with such dark blue-purple standards. The ruffled falls are a lovely shade of pink. And the tangerine beards are an added attraction. 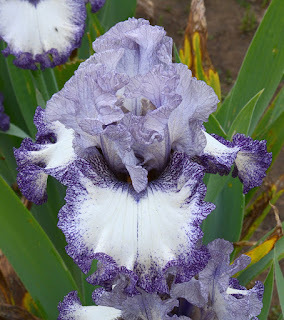 This flower has a unique color pattern with outrageous ruffles. It illustrates that there are many different types of ruffles, and these are especially nice. Let’s hope that the floppy standard is not typical. 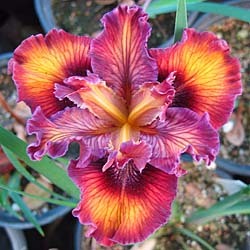 True pink standards sit above royal purple falls with a delightful spray pattern surrounding the red-orange beards. 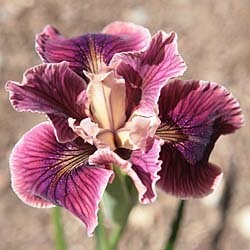 I am hopeful that the tucked fall is a rarity, since this is a no-no in tall bearded irises. The yellow standards are in good contrast with the amazingly deep cobalt blue falls. The brown edges and hafts of the falls add significant charm. The standards are white. The falls are purple, with the purple bleeding out onto the lighter colored border. And the border seems to actually glow. The red beards complete the look. I was attracted by the saturation and clarity of the gold of the standards and the blue in the falls. The tan edges of the falls make it even more appealing. The beards pick up the color of the edges. It is good to see that the ”plicata man” is still working on plicatas. With the plicata-type flower there seems to be an infinite possibility of colors and patterns. 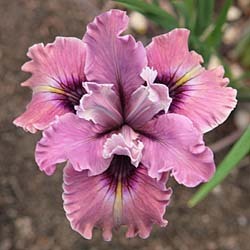 Here I particularly like the lavender standards with darker purple veins. It gives the impression of a fine filigree pattern. The bus captains loaded us into the buses way too soon. I could easily have used a couple more hours. There were entire sections of the garden that I didn’t even see. And I know there were many seedlings that I missed. Of course, there were many other photographers busy in the garden. If you are one of those photographers, we would like to hear from you. In the blog spirit, won’t you submit some of your photos as comments to this article? 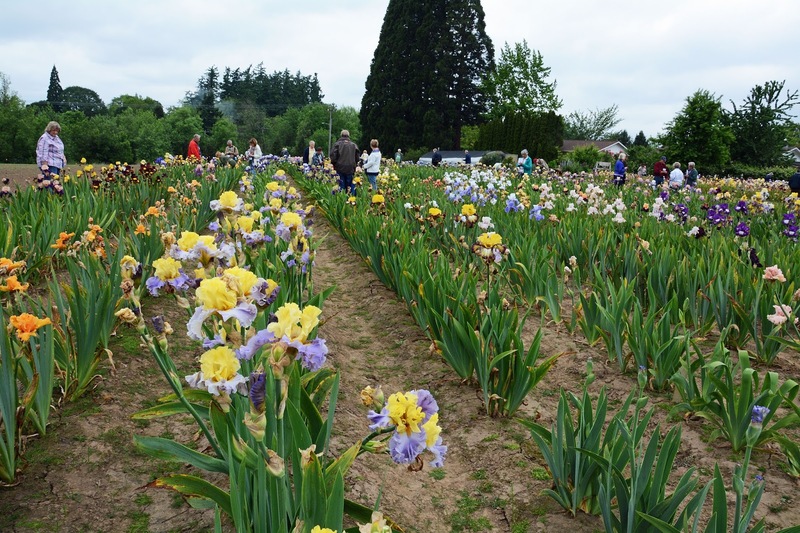 As I rode in the bus, I was satisfied that I finally was able to visit Keith Keppel’s Oregon garden. Thank you, Keith. Once again I've found an article to wrap around 'Summer Radiance.' I'll never forget the first time I saw it bloom. I was coming home from a Region 7 spring meeting. The first stalk of what was to become 'Summer Radiance' was showing lots of bright yellow when I left for the meeting. When I arrived back home, I dropped my suitcase on the back path and tore off down the hill to the bed by the pond. I was thrilled with the blooms and have found more things to love about it in the 20 years since its introduction! I was just as thrilled six weeks later when it put up a summer stalk. That sealed its fate! It would be with me forever! Twenty years after its introduction, I'm still using it in breeding. I've done the research and know it does not produce plicatas. A part of that research was growing nearly 200 seedlings from 'Summer Radiance' X 'All Revved Up.' Not a plicata in the bunch. This makes me happy, since I'm not fond of haft marks. 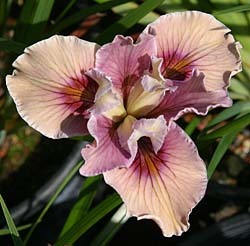 When breeding with pastels, this is one of my top contenders. I can also use it when I want to inject some yellow into another line, with full understanding that I may get all kinds of rebloom, too. I still want to turn the beard red, but I haven't decided what to use it with, yet. 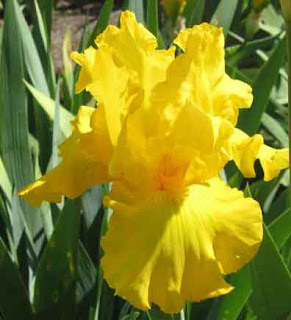 'Summer Radiance' is from 'Lemon Reflection' X 'Hindenburg,' so it's only one step away from a red beard. I would already have some results of breeding for red beards, but I lost all of the seedlings from 2013. Maybe next spring. 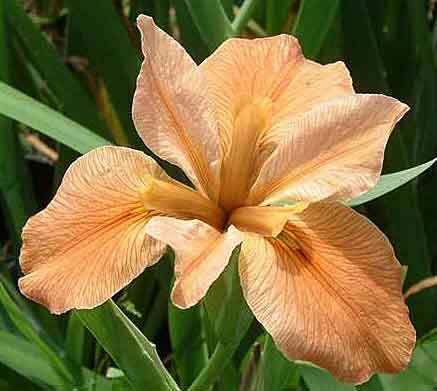 As 'Summer Radiance' grew in other climates, we discovered that it can fall or cycle bloom. It bloomed here in early July as repeat bloom. Then, it bloomed early fall further north. In Virginia, Mike Lockatell reports that it reblooms often and well, which is simply proof that you should never give up on a reblooming iris. 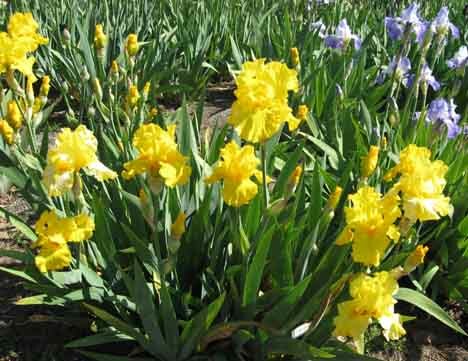 When crossed with 'Radiant Bliss,' it gave 'Summer Honey' which can bloom from spring through fall frost. 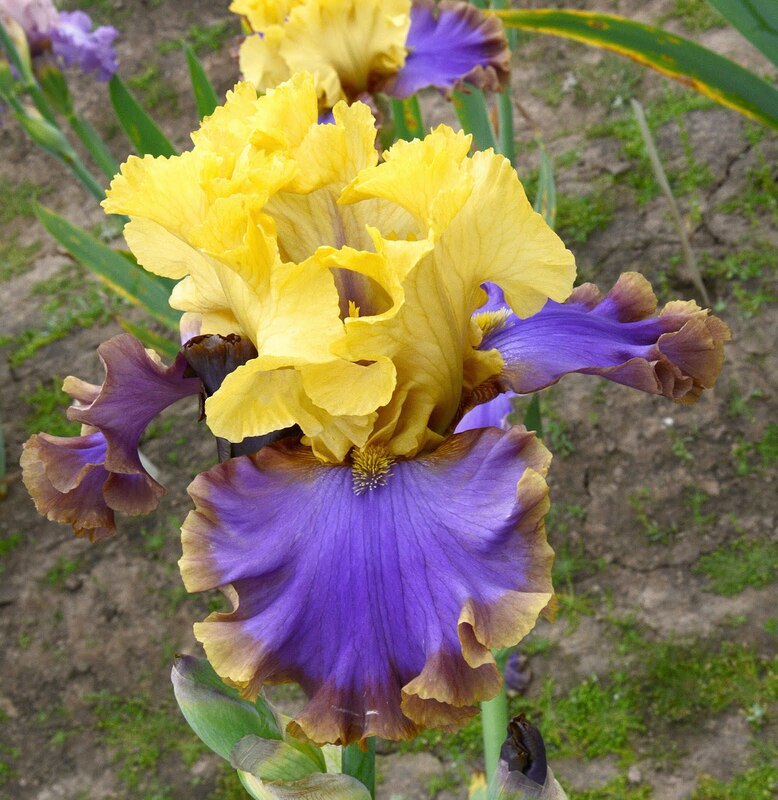 So, all told, 'Summer Radiance' is a pretty special reblooming iris. 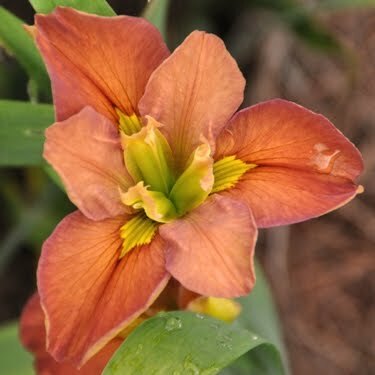 It has probably taught me more about rebloom than any of my other seedlings. 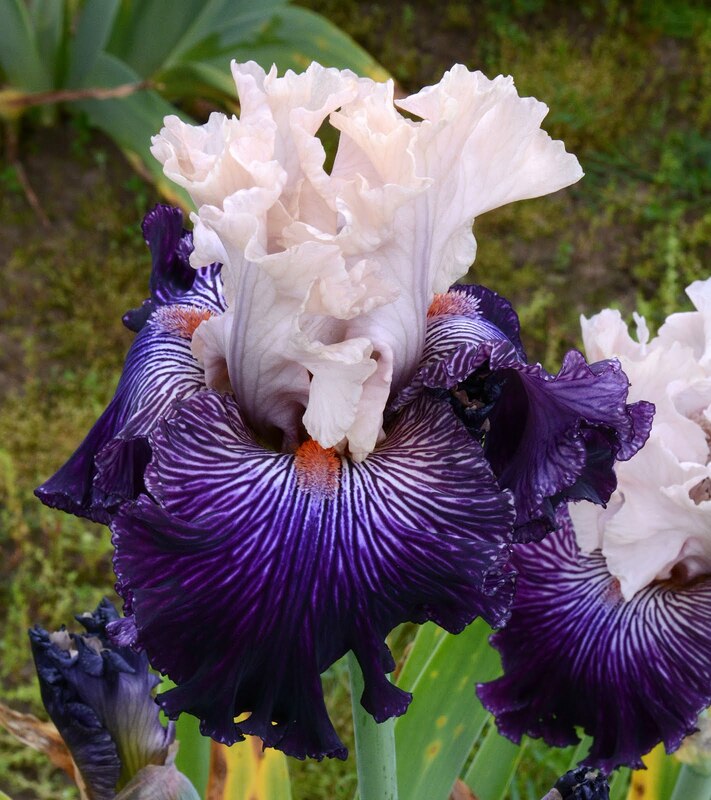 Hope your new year is filled with many gorgeous iris blooms. Merry Christmas to all. 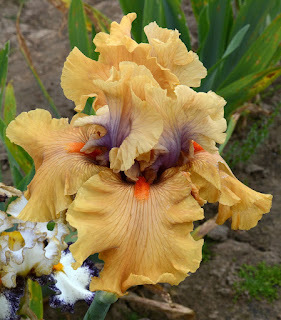 To all good iris dreams! Rose to pink PCI flowers appear in nature from time to time. Debby Cole urged me to collect seeds from a wild I. tenax population along the Columbia River a decade ago; this population is notable for its cool pink flowers. 'Broadleigh Rose' is a typical wild-type selection with rose pink flowers, a yellow signal, narrow petals and veining in darker pigments. 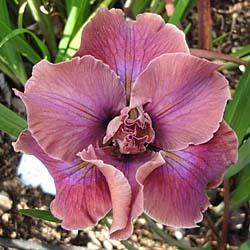 But pinks have gotten bold in the garden, moving into modern forms with wider, ruffled petals and more intense colors. The following is a small selection of the variety of modern pinks. As with other reddish-hued flowers, the pink coloration is a balance between cool blues/lavenders/purples in the intracellular fluid and warm tones (yellows/oranges) inside plastids in each cell. 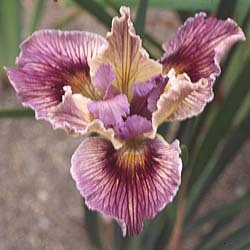 'Altar Boy' is a light pink, near flesh-toned flower with a dark signal and some veining. 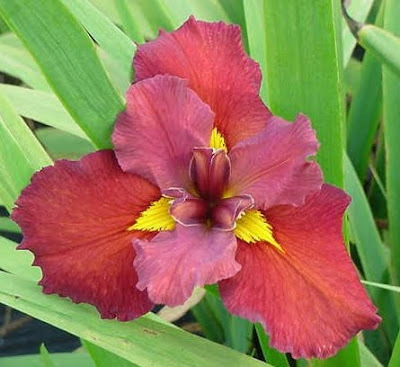 Petals are broad, and the two-toned color of the falls is very pleasing. 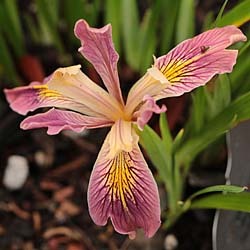 PCI 'Erika Denise' has intense veining on a light pink background. The darker signal band sets off the pink background, and the contrasting style arms and standards add to a nice complexity. With more intensely pink petals, 'Marriage Proposal', another Ghio hybrid, has with even wider falls and standards, and intensely dark signals on falls. 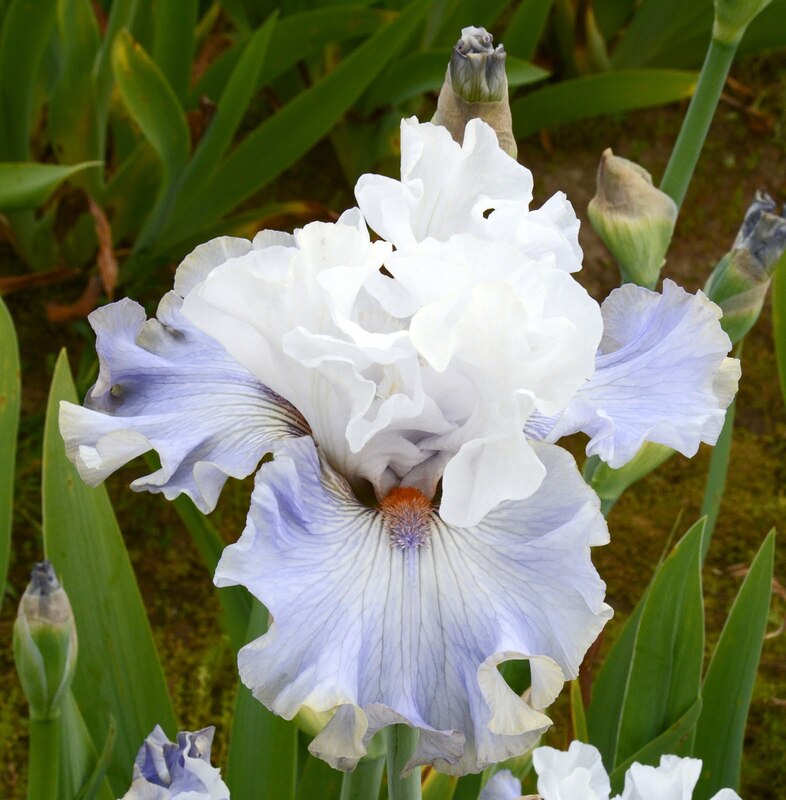 Ruffling pale edges and lighter center streak add complexity to this flower. Hybrids that move towards solid colors include this one, with petals almost all the same color, and yet, being PCI, there are veins and central petal color variations leaning towards pale blues that lift this flower right out of the ordinary and into a lovely ethereal pink. Wide ruffled petals don't hold up well in wet spring areas, but this one is worth contriving a cover for during flowering. 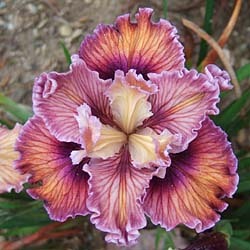 PCI 'Fallen Plums' edges towards purple, and displays a lovely intensity of color on the falls between the base color, darker veins, light signal and lighter rims. Moderate ruffling means this flower holds up well in wetter spring climates. And then we move off into dramatic contrasts between pink and yellow, pinker and orange . . . Initially the contrast seems almost innocuous, some dark rose veins on a lighter fall, a nicely yellow signal, a small yellow slash. But these are PCIs, and so the contrast continues: more veins, lighter background on falls, darker halo on signal, more intensity of color on standards. And more: wider, darker, more ruffles, more veining. More contrast. Over-the-top gaudy, with PCI 'On the Bubble', raspberry red edges and veins, darker halo on signal, and yellow gleaming through on the falls. And yet the effect is still pink, albeit a hot luscious pink with neon-bright color contrasts, like a brilliantly-colored shaved ice confection on a hot summer day. 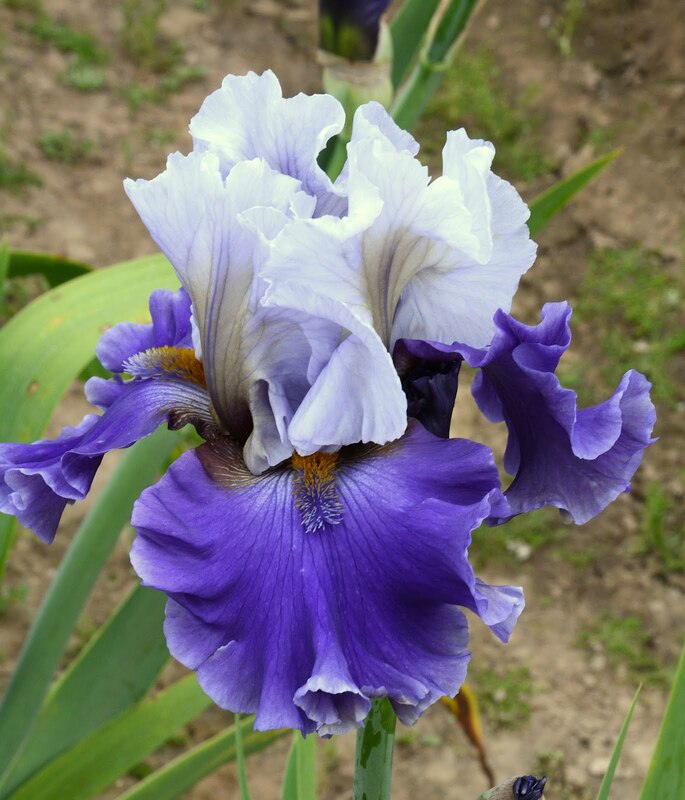 I know there have been others who posted articles about blue irises but I would like to have my chance to sing their praises. 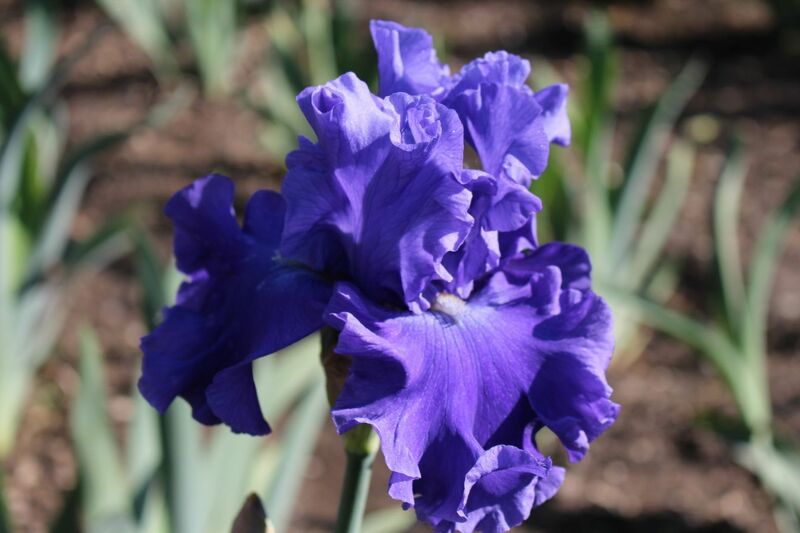 I am hoping you will be tempted to plant a few if your garden is lacking blue. Over the last 30+ years my color tastes have changed almost every year. 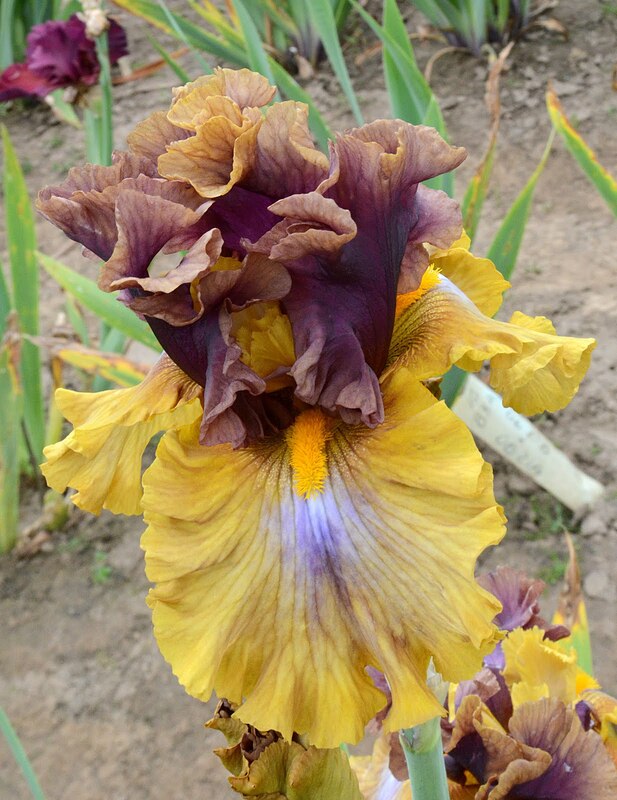 One of the first years I started ordering I was drawn to the rusty orangey brown irises like 'Carnival Time', 'Copper Classic', 'Brindisi', 'Starburst', 'Astro Flash', and 'Copper Mountain'. One year I was drawn to blacks, some years I concentrated on Dykes Medal winners. For a while I saw blues in the catalogs and it was as if they stood out more intensely than the other irises. Some years the pinks and reds look tempting to me. The last two years I've been attracted by the blues again and have placed orders with several companies who have offered them. Here for your viewing are some of my favorites, but by no means all of them. I have many irises that are from different decades because we have been growing them for such a long time. You will find that some of my blues are *historics and others are more modern. 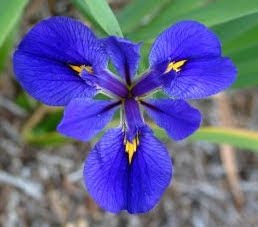 This iris has perfect form as far as I am concerned. In some light it looks almost white but it is a pale blue. It grows well for us here and needs little or no care except it has to be divided often because it grows so well. 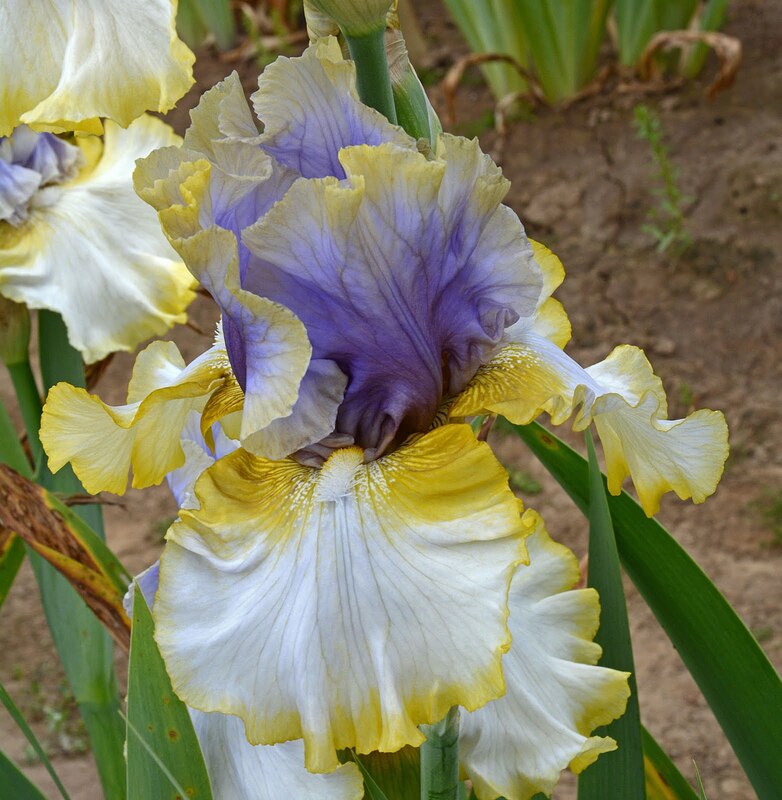 This 50 year old iris is such a stand-out in the garden. It has very clear, clean blue color and photographs pretty true to color in my opinion. The contrast between the deep blue and the white beard is striking. Even without ruffles and lacing it is simply elegant. One of my top 5 blues. I love the fading and the *reverse *bitone coloring. Even though this one was included in my *broken color blog it is still also one of my favorite blues. If you are a little timid to grow broken color start with this one. Having just two colors it isn't as bold as some of the others. A friend gave it to me as a piece of rhizome a little bigger than a dime. I was sure it wouldn't grow and if it did I would misplace it. We put a stake by it so we wouldn't hoe it out with the weeds. It bloomed the second year and here is the bloom. Thank you, friend, for sharing it. The beautiful shading on it reminds me of 'Honky Tonk Blues' but 'Skywalker' is a lighter, more delicate blue. As you can see it stands out in the garden. The darker blue behind it is 'Sheer Bliss'. This was a substitute that Schreiner's sent me because they couldn't send 'Bleinheim Royal'. I was disappointed until I saw this one bloom. This is a beautiful, true *self where even the beard is blue. I love the color and all the ruffles. 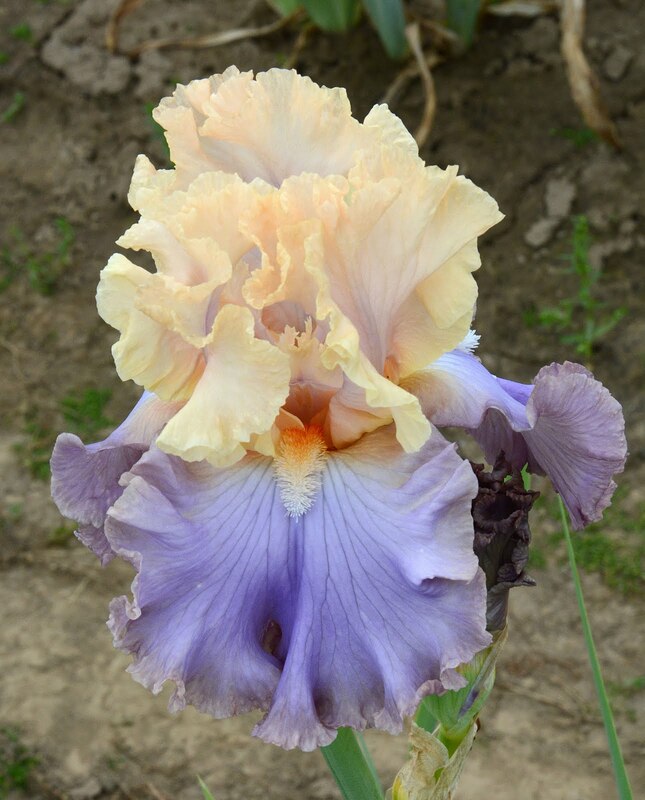 This 43 year old iris is still one of my favorites. 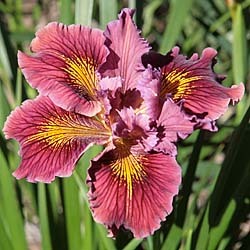 Perhaps it acts as straight man to the other more flamboyant irises. Simply pretty! This is one of my newer blues. 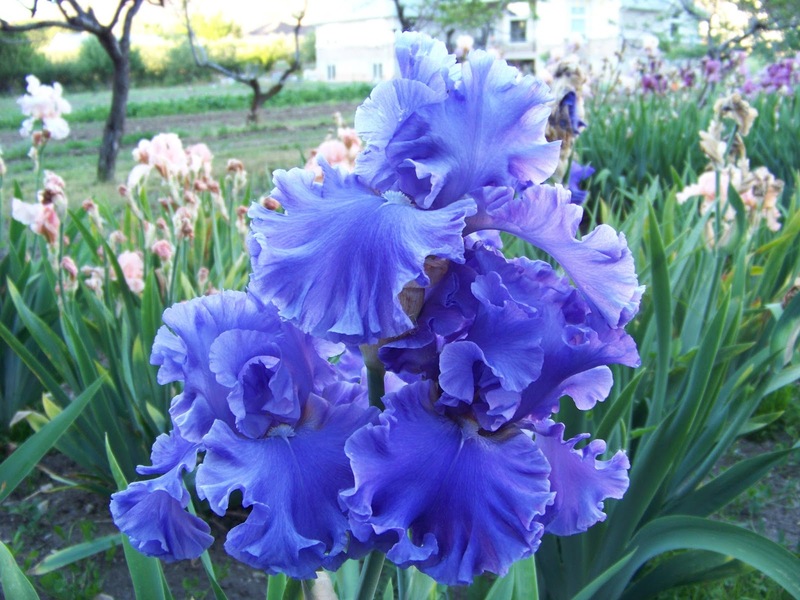 It is described in the Iris Wiki as having standards of cornflower blue, falls of violet blue shading to steeplechase blue. 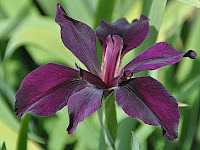 This picture, as all others in this blog, was taken in our garden by me. 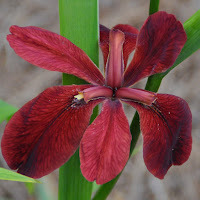 This is a very dramatic iris. It can be classified as an *amoena or a *neglecta. I have several new ones that I don't have pictures for. They are 'Dangerous Mood', 'Baltic Sea', 'Water Waltz', 'Wake Water', 'Blueberry Bliss' and 'Grecian Sea'. I would like to show those another time. Have you planted blues? What do you like to pair them with? I would love to hear from you. 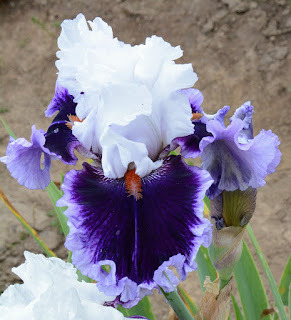 Labels: blue irises, Blutique, Dawn Mumford, Grecian Skies, Honky Tonk Blues, Keith Keppel, Neglecta, Shreiner's, Skywalker, Stairway to Heaven and Adriatic Waves.